The Bio conference in our city was such a great conference and we were fortunate to be selected for 8 of the events…several were held at the amazing Metro Atlanta Chamber of Commerce Rooftop (MACoC) and several at The World of Coca-Cola! If you have not seen this wonderful venue you must consider it. Our team is happy to give you information about the venue or take a look at their website http://www.worldofcoca-cola.com/. Bio ended their conference on a wonderful note at their closing party held at one of Atlanta’s most acclaimed music venues—the historic Tabernacle http://www.tabernacleatl.com/. Have I exhuasted you yet? Have a wonderful, safe weekend. I’ll be finishing up some reading over the long weekend and pruning my hedges (literally). I may even swing by Goldbergs Deli and order their Nova Platter (my favorite). Above photo by Sarah Dorio compliments of The Atlantan Magazine. This entry was posted in Atlanta Caterer, Bio conference, Goldbergs, Metro Atlanta Chamber of Commerce, Rolls Royce, The Atlantan, The New World of Coca-Cola, The Tabernacle, Tony Conway. Bookmark the permalink. It was so great being selected to work on the design and entertainment component of the grand opening of Hotel Palomar in Midtown Atlanta! Was it just me or was everyone there gorgeous? We certainly are a great looking town aren’t we? Anyway, I think it takes great courage to open any new business in the current economy. So…my hats off to the hotel and hope you will all support them. They’re also pet-friendly and eco-friendly so they already have my vote. To learn more about the Hotel go to http://www.hotelpalomar.com/. 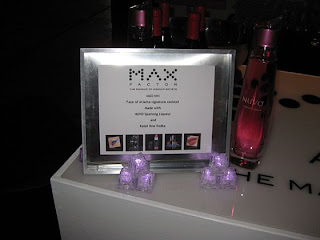 On the other side of the town, it was also great being selected to partner with our long time friend Atlanta Magazine’s Marketing Whiz Randy Stone on the MAX Factor Face of Atlanta event at Mason Murer…where we served the Diageo MAX-TINI made with NUVO and Ketel One Vodka! This is a great drink! 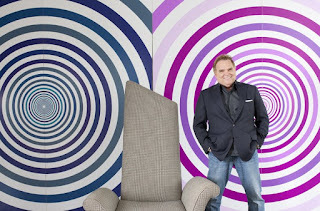 This entry was posted in atlanta magazine, diageo, hotel palomar, nuvo, randy stone. Bookmark the permalink. We asked award-winning event planner Tony Conway for the latest buzz on the party circuit: When it comes to food and dining, there are food trends, décor trends and architecture trends. But do you give much thought to the table? Trust me, all good hosts (event planners, restaurateurs and those gathering friends in their home) pay as much attention to the details of the table setting and serving wares as they do to what they serve. Current Trends: Instead of spending money on party items likely to be discarded later, access the rich vault of your personal possessions. To combat depleting reserves and a topsy-turvy economy, floral designer Kim Vasil, of Atlanta, has focused her current work on “sustainable tables” for parties and events. Recently, Vasil pavéd an entire table surface with wheat grass, then added a series of vignettes using hearty succulents, cacti and unique ground cover such as hens-and-chicks, flapjack succulents and creeping sedum. She even suggests using what you already have—dig up something from your garden to use as a centerpiece or use antiques that are chock-full of character. Personality always creates a lasting impression. 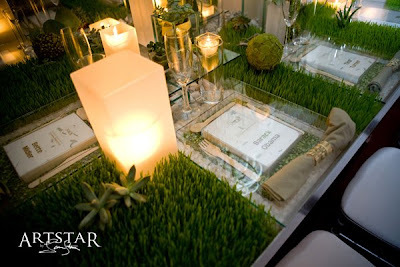 And with the all-around “green” trend, your table and party will be right in step. This entry was posted in delta sky, laura stone, succulents, sustainability, tabletop. Bookmark the permalink. The founder and president of A Legendary Event, Conway’s client list includes Jane Fonda, Elton John and Tyler Perry (he oversaw the million-dollar opening gala for Perry’s new studio last fall). A more-is-more kind of guy, Conway’s catering and design company turned a section of the unfabulous Civic Center into a sumptuous event space during the run of the King Tut exhibit. When the Atlanta Symphony Ball chose “La Vie en Rose” as its theme a couple of years ago, Conway showered the InterContinental Hotel’s ballroom with 7,000 blooms. “My life is just a party,” said Conway, whose 12-year-old company employees 200 staffers and 42 managers; his partner, Steve Welsh, is the firm’s creative director. “I love what I do, even when I’m not doing it. I’ve never gotten bored.” A fixture on the scene (and behind the scenes) at the city’s major society and charity events, Conway is well-known among the air-kissing set, but his background might not be. The first crowds Conway fed were the field hands on his great grandparents’ farm in Weinert, Texas, a dot on the map about 250 miles northwest of Dallas. He got his first paying job by doctoring his birth certificate, and once contrived to bartend during an Ike and Tina Turner concert even though he was too young to drink legally. Conway’s unflappable demeanor was formed in the predawn hours down on the farm, where he spent summers as a child. He learned the importance of timing (if the biscuits weren’t served hot, his great grandmother would say, the butter won’t melt) and of hard work. “I remember my great grandfather saying, ‘We’re going to hoe cotton,’ ” he recalled. “I said, ‘I’m not doing that. The hoe’s too big for me.’ “Without missing a beat, the old man snapped the tool over his knee and handed the shortened implement to his 7-year-old great grandson. “He used the other end to give me a spanking,” Conway recalled. The future events planner honed his social graces amid the ladies in his great grandmother’s sewing circle, and learned the importance of giving back and not wasting. “We would keep the ends of vegetables to make a stew or feed the animals,” said Conway, who remembers sharing the garden’s bounty with neighbors. His entrepreneurial streak blossomed as a teenager. He recalls sitting on the tailgate of his mother’s station wagon, tossing the Houston Post onto driveways in the dark. At 15, he aged himself a year with the deft application of correction fluid and landed a job at an ice cream parlor. After college at the University of Texas at Austin, where he studied business and marketing, Conway and a friend opened a gourmet deli in the Houston area. Not satisfied with walk-in customers, he decided he’d like to get into catering. Some family friends held seats on the art museum’s board, and Conway persuaded the museum to give his fledgling business the contract for its black-tie gala. The only problem, of course, was that he had no experience. “We called Glorious Food in New York,” he said, referring to an established, high-end events firm there. “We asked if we could work for free, to learn.” At the end of the catering crash course, Conway rallied every friend and relative he could talk into it to rent a tux and help on the big night. The event went well, but his business partner was nearly done in by the experience and closed the deli. “I was jobless,” Conway said. “I was like, ‘What do I do now?’ “Ready for another leap of faith, he answered a Marriott ad seeking a director of catering. “You don’t know what you’re doing, do you?” the interviewer asked. Conway pleaded for a chance, and thrived. 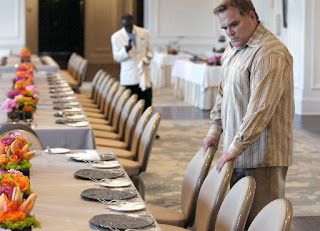 He ran the catering operations in several Marriotts, then interviewed on Christmas Eve 1991 for a position as the Buckhead Ritz-Carlton’s director of catering and conference services. “I drove to Atlanta in a snowstorm,” he said. “My first day I got a phone call saying, ‘Employees can’t get to work.” His professional Atlanta debut started with a shift manning the phones for a snowbound switchboard operator. “He never ruffles,” said Charlene Crusoe-Ingram, a retired Coca Cola executive who now donates her time to the arts and charity. She is co-chairwoman of Meal to Remember, a November gala benefiting Senior Citizen Services. Conway will handle the decor, as he did for the host committee luncheon he was preparing for the other day. The ball is likely to draw more than 300 people, but Crusoe-Ingram has attended Conway-catered luncheons for eight or 10. She said he’ll attend to a handful of people in someone’s home, and a ballroom packed with social swans, with the same level of care. This entry was posted in A Legendary Event, Atlanta Caterer, events, sandra baldwin, Tony Conway. Bookmark the permalink.